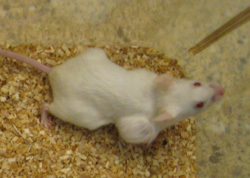 Mice with dysfunctional immune systems that receive human embryonic stem cells produce tumors called teratomas. One of the characteristics of embryonic stem cells is their ability to form unusual tumors called teratomas. These tumors, which contain a mixture of cells from a variety of tissues and organs of the body, are typically benign. But they present a major obstacle to the development of human embryonic stem cell therapies that seek to treat a variety of human ailments such as Parkinson’s, diabetes, genetic blood disorders and spinal cord injuries. Now a team of biologists at UC San Diego funded by a grant from the California Institute for Regenerative Medicine, the state’s stem-cell funding agency, has discovered a way to limit the formation of teratomas. In this week’s issue of the Proceedings of the National Academy of Sciences, the researchers report that they have identified a new signaling pathway critical for unlimited self propagation of embryonic stem cells. Using small molecule compounds that inhibit this pathway, the scientists were able to dramatically reduce the potential of embryonic stem cells to form teratomas. If researchers could halt the propagation of human embryonic stem cells during lineage-specific differentiation before they are transplanted, they could avoid the risk of producing teratomas. Other scientists involved in the discovery were Steven Briggs, a professor of biology at UCSD, and UCSD biologists Matteo Moretto-Zita, Hua Jin, Zhouxin Shen and Tongbiao Zhao. Xu recently received a $1.2 million grant from the California Institute for Regenerative Medicine for another research effort to explore a new strategy to induce immune tolerance to grafted cells derived from human embryonic stem cells.